Le Club AccorHotels is about to launch in two weeks their latest Worldwide up to 40% off Private Sales for stays through 2019. 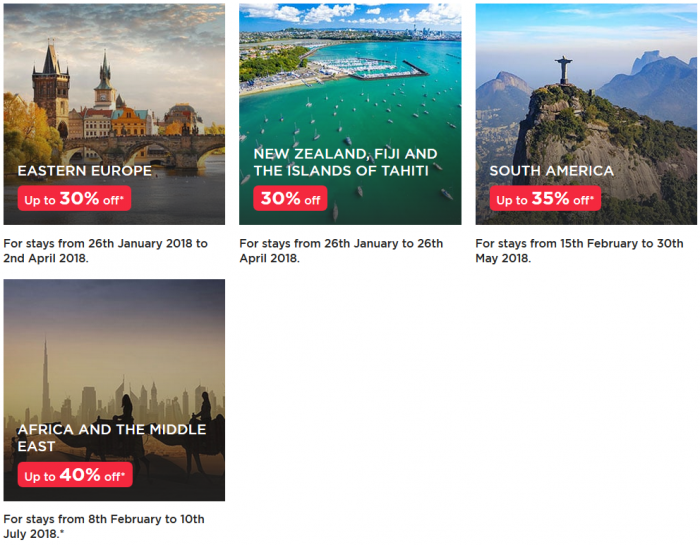 As is the case with these sales, the discounts, minimum stay requirements and actual stay dates are region specific. Just wanted to give heads up for our readers that Accor is about to launch this sale. They don’t usually put these sale pages up this early. Not sure why they did this time around? I will have separate post up when the sale goes live in about two weeks time. The “up to 40%” discount is only valid in participating hotels. Offer valid subject to availability in participating hotels. Promotion cannot be combined with other offers. Offer valid for booking from 16th January 2018 to 25th January 2018 for stays from 8th February 2018 to 10th July 2018 in the Middle East and Africa/bookable only on accorhotels.com and AccorHotels Group websites. The “up to 40%” discount is based on the lowest unrestricted rate. The total cost of the stay is debited upon booking. The booking cannot be changed or cancelled. All reservations must be guaranteed with a credit card that is valid on the first date of your stay. Le Club members can accumulate points with this booking. Accor Plus members enjoy an additional 10% discount on hotels in Asia Pacific participating in the Accor Plus programme. The special discounts are exclusive to Accor Plus, Le Club AccorHotels members and subscribers to AccorHotels Group websites. The special discounts are based on the best unrestricted rate available each day over the chosen stay period. Bookings are payable at the time of reservation and are non-exchangeable, non-refundable and non-transferable. No cancellations or changes are possible. Offer is subject to each hotel’s conditions and availability. This promotion cannot be combined with any other offer(s). Booking with Le Club AccorHotels points is not available for this offer. Le Club AccorHotels members can accumulate points with this booking. Accor Plus terms and conditions apply. The special discounts (stay two nights, save 25%) are only valid in participating hotels only and are subject to each hotel’s conditions and availability. This offer can be booked from 16th January 2018 to 25th January 2018 on AccorHotels Group websites. The special discounts are based on the best unrestricted rate and apply to stays for all hotels. To confirm your booking, the non-refundable payment of the stay is entirely deducted upon booking. To the extent permitted by law, no cancellations or changes are possible. This promotion cannot be combined with any other offer(s). Le Club members can accumulate points with this booking*. Accor Plus members receive an additional 10% discount on this promotion. Exclusive sale (40% in Sofitel, MGallery, Pullman, Mercure, Novotel and Novotel Suite and 30% ibis and ibis Styles) is only valid at participating hotels. This offer can be booked from 16th January to 25th January 2018 at accorhotels.com. See the arrival dates at the sale. Special discounts are based on the best unrestricted rate (rate without conditions). The payment of your booking will be deducted in full after completing your reservation. No cancellations or changes are possible. Based on availability at the participating hotels. This promotion is not combinable with other offers. Le Club AccorHotels members can earn points on bookings of this offer. 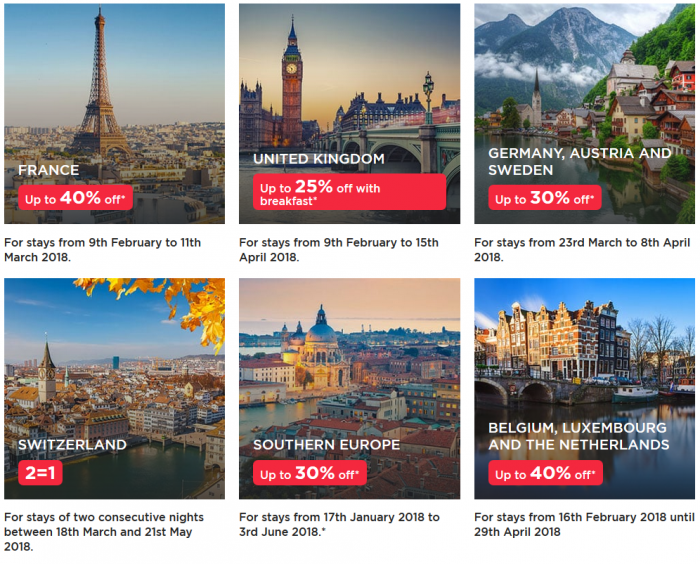 Exclusive sale (Up to 30% off in Swissôtel, Rixos, Sofitel, MGallery, Pullman, Mercure, Novotel, ibis, ibis budget, ibis Styles) is only valid at participating hotels. This offer can be booked from 16th to 25th January 2018 on AccorHotels Group websites. See arrival dates for the sale. Special discounts are based on the best unrestricted rate (rate without conditions). The offer is based on availability at the participating hotels. This promotion is not combinable with other offers. Le Club AccorHotels members can earn points on bookings of this offer, except in Swissôtel hotels. Offer is valid for stays between the following dates: 26th January 2018 to 2nd April 2018. A special discount of 40% applies for Pullman, Mercure, Novotel and Novotel Suites. A special discount of 30% applies for Le Royal Monceau, Fairmont, Sofitel, MGallery by Sofitel, ibis, ibis Styles, ibis budget and HotelF1. Breakfast is included for ibis Styles. This offer can be booked from 16th to 25th January 2018 on AccorHotels Group websites for stays from 9th February 2018 to 11th March 2018. The special discounts are based on the best unrestricted rate. Full payment for the stay is entirely deducted upon booking. No cancellations or changes are possible. Offer subject to availability in participating hotels. This promotion cannot be combined with any other offer(s). The Private Sale offer “Germany, Austria and Sweden: up to 30% discount on your stay” is valid for bookings from 16th to 25th January 2018 for stays from 23rd March to 8th April 2018. The offer can only be booked on the websites AccorHotels.com, Sofitel.com, PullmanHotels.com, Novotel.com, Mercure.com, ibis.com, HotelF1.com. For ibis and ibis Styles you get a discount of 20% on the best flexible rate for the dates requested upon booking. For Sofitel, MGallery, Pullman, Fairmont and Swissôtel you get a discount of 30% on the best flexible rate for the dates requested upon booking. For hotels in Germany only: in case of non-usage, earnings from a substitute accommodation contract, as well as saved expenses will be deducted. This offer cannot be combined with any other promotion or offer prices. This offer is subject to availability at participating hotels. This offer is valid until January 25th 2018 for stays from February 1st 2018 to September 3rd 2018. Save up to 30% on a minimum two-night stay at Sofitel hotels in the USA and Canada. Save up to 30% on a minimum two-night stay at Fairmont hotels in the USA, Canada and Mexico. Save 25% on a minimum two-night stay at Swissôtel hotels in the USA. Save 20% off a minimum two-night stay at Pullman hotels in the USA. Save up to 30% on a minimum two-night stay at Novotel hotels in the USA, Canada, and Mexico. Save up to 10% on a minimum two-night stay at ibis and ibis Styles hotels in Mexico and the USA. Blackout dates apply. Offer subject to hotel’s sales conditions. A minimum 15-day advance purchase and a fully paid, non-refundable deposit is required at time of booking. Client must provide credit card details to qualify for this promotion. No change or cancellation can be made after booking. Taxes not included. Surcharges apply for third and fourth adults. Other hotel conditions may apply. The special 30% discount is only valid in participating hotels across New Zealand, Fiji and the Islands of Tahiti. This offer can be booked between 16th January 2018 and 25th January 2018 on AccorHotels Group websites for stays from 26th January 2018 to 29th April 2018. The special discounts are calculated based on a 30% reduction on the best unrestricted rate available each day over the chosen stay period. Le Club AccorHotels members can accumulate points with this booking and Accor Plus members receive a 10% additional discount. This offer can be booked from 16th January 2018 to 25th January 2018 on AccorHotels Group websites (accorhotels.com, ibis.com, novotel.com, mercure.com, sofitel.com). For stay dates, please see below each country’s sales conditions. The special discounts (from 20% to 30%) are based on the best unrestricted rate and are valid only in participating hotels. The entire payable amount is deducted upon booking. No cancellations or changes are possible. This offer is subject to availability in participating hotels. This offer cannot be combined with any other offer(s). Le Club AccorHotels members can accumulate points with this offer*. Offer valid for all bookings made between January 16th and January 25th 2018 on all AccorHotels Group websites for all stays of two consecutive nights between 18th March 2018 and 21st May 2018. The discount is applied to the best unrestricted rate. The full cost of the stay will be deducted from your credit card upon booking. Advance payments are non-refundable, and no changes or cancellations are allowed after booking. This offer cannot be combined with any other offer or promotion. Offer valid in participating hotels in Switzerland, subject to availability. The Private Sale in the United Kingdom and Ireland offers up to 25% off with breakfast* in participating hotels in the UK and Ireland. Offer is subject to availability. Promotion cannot be combined with any other offer(s). Offer is valid for bookings made between the 16th and 25th of January 2018 for stays from 9th February to 15th April 2018 and must be booked on AccorHotels Group websites. Up to 25% discount with breakfast in participating ibis, ibis Styles, Mercure, Novotel, Pullman, MGallery and Sofitel hotels. 25% discount on room only (excluding breakfast) at the Fairmont St Andrews. 20% discount on room only (excluding breakfast) at all participating UK ibis budget hotels. The discount is based on the lowest unrestricted rate. The total cost of the stay is debited upon booking. The booking cannot be changed, cancelled or modified. All reservations must be guaranteed with a credit card that is valid on the first date of your stay. Le Club AccorHotels members can earn points with this booking. Offer exclusive to Le Club AccorHotels members and AccorHotels subscribers. Discount up to 35% per night valid only at participating hotels in South America. For selected ibis, ibis budget and ibis Styles hotels: 25% discount per night for AccorHotels.com subscribers and Le Club AccorHotels members. For Sofitel, Pullman, Grand Mercure, MGallery by Sofitel, Maksoud, Caesar Business, Mercure, Mama Shelter, Novotel, Swissôtel and Adagio aparthotels: 35% discount per night for AccorHotels.com subscribers and Le Club AccorHotels members. Offer subject to availability in participating hotels. Promotion cannot be combined with other offers. February 2018 and 30th May 2018, booked through this link only. 24 hours of exclusive pre sale for Le Club AccorHotels members. The discount up to 35% per night is based on the best price without conditions. The total price of the accommodation must be paid by credit card at the time of booking online. No cancellations or changes. Fairmont, Raffles, Swissôtel, Banyan Tree, Angsana and Rixos hotels are not part of the Le Club AccorHotels loyalty programme. Clients booking a stay in one of these hotels won’t earn Le Club AccorHotels points. Accor Plus members do not get any additional discount when booking a stay in Fairmont, Raffles, Swissôtel, Banyan Tree, Angsana and Rixos hotels.